Random Handprints - A NYC Mom Blog... live from New Jersey: Recipes for the Best Peach Cake and the Best Peach Crumble. Ever. Recipes for the Best Peach Cake and the Best Peach Crumble. Ever. 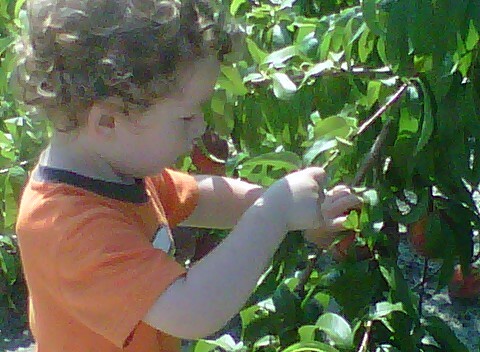 Earlier this summer, I took my kids peach picking. It was fun, even if the peach picking outing cost a small fortune and lasted only about 20 minutes. 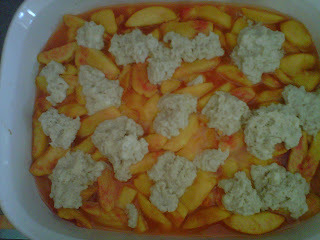 Next I had to figure out how we were going to eat the 17 pounds of fresh peaches lolling around on the kitchen counter. Here are the two best peach recipes - one for Peach Cake and one for Peach Crumble from the many we tried. I highly recommend these peach recipes for being totally easy to make, and yet incredibly delicious, and perhaps most importantly, using the largest quantity of peaches. I am happy to report we ate every peach. And in fact, we are about to go peach picking again and repeat the whole process! This one is for you poor fools who went both peach picking and blueberry picking. For the fruit quantities, just throw in what you have. 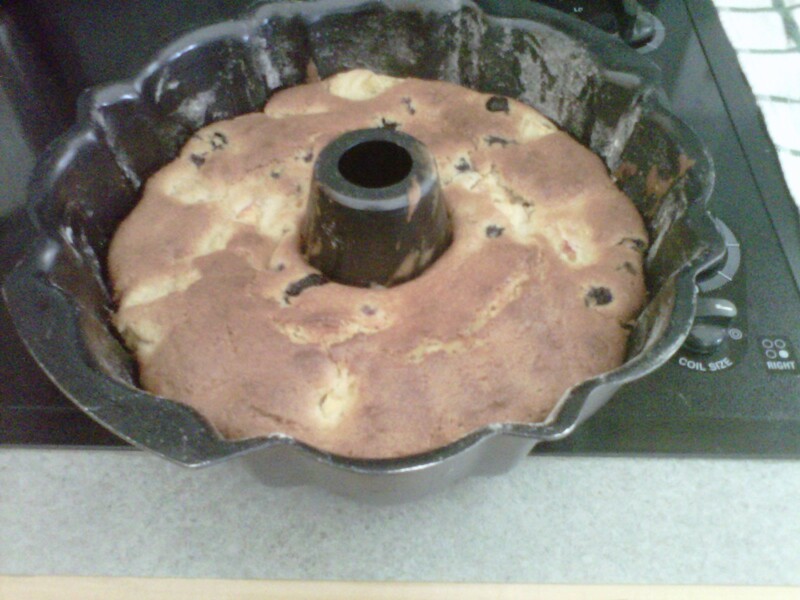 I doubled the peach quantity and put in about half the blueberry amount and it turned out great. Remember the key here is to use up as much of your fresh produce as possible. 4. Mix in the eggs, one at a time. 5. Add the milk, mix thoroughly. 6. In a separate bowl, combine the cake flour and baking powder. Add to the creamed mixture. 7. Stir in peaches and blueberries until just combined. 8. Pour the cake mixture into the greased and floured bundt pan. 9. Bake in a 350 degree oven for 60 to 70 minutes, or until a knife inserted near the center comes out clean. 10. Allow the cake to cool in the pan for 10 to 15 minutes before turning out onto a wire rack to cool completely. 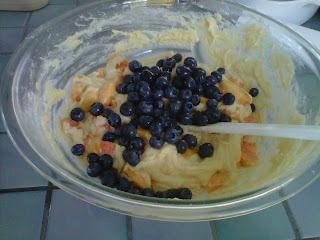 Serve as is, or add a few extra fresh blueberries and peaches on top and a dollop of whipped cream. I am sorta a fruit crumble devotee, so while there are lots of crumble recipes I think are delicious, this one wins for it's inspired choice to pair biscuit with peach. And also because it's really, really easy to make. 2. 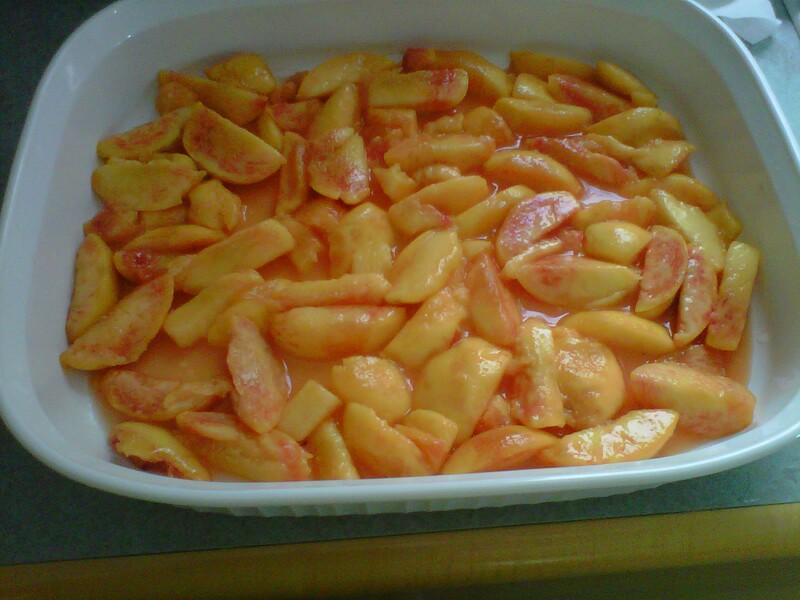 Gently toss the sliced peaches with sugar, lemon juice and cornstarch in a medium baking dish. Bake in the oven for 10 minutes. 3. While the peaches are in the oven, stir together flour, sugar and baking powder. Blend in the butter with your fingertips or a pastry blender. It should have a coarse texture, don't be tempted to over-mix. Add the warm/boiling water and stir until the biscuit topping just holds together. 4. 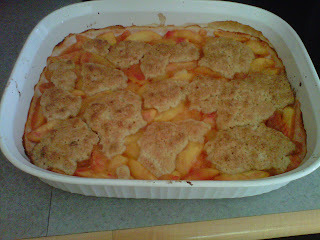 Take the peaches out of the oven, and cover with the biscuit topping by dropping by the spoonful. The entire top of the peaches will not be covered, but the topping will spread when it cooks, and the end result will be a perfect, dappled crumble topping. 5. Bake for 25 minutes, or until topping is golden. In addition to peach desserts, also delicious are peaches in green salads, peaches cooked on the grill, peach salsa, and peaches with basil and prosciutto. Do you have a favorite peach recipe? Share it here. Goodness knows I'll need all the ones I can get in a few days. Those look outstanding!!! Really, really delicious! Did you force Ziggy to wear the peach-colored shirt? @lester, uh force is sorta a strong word dontchathink? how about suggested? facilitated the wardrobe choice?